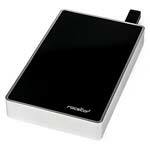 The 2TB RocSecure EX31 USB 3.1 Encrypted Portable Solid State Drive is an advanced AES 256-bit real-time hardware encryption portable drive with FIPS 140 Level-2 and NIST certified cryptographic processor. The Rocsecure EX31 has the latest innovative encryption technology with more power and speed. Its cryptographic processor performs full disk encryption protecting entire Data-at-Rest. The Full Disk Encryption (FDE) solution is OS independent with no extra software, or driver component needed.